Enough of the promotion for a while (and the Chaucer). I thought I'd share the spring with you as seen in my Yorkshire garden this morning. 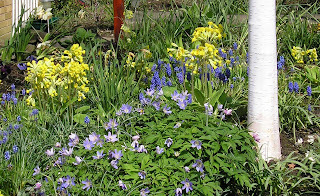 I really love my garden in spring, and primroses and cowslips always give me a lift.